Earlier this week I recorded a live video on social media talking about portion distortion. In this video, I display a sweet potato that’s literally the size of my head! 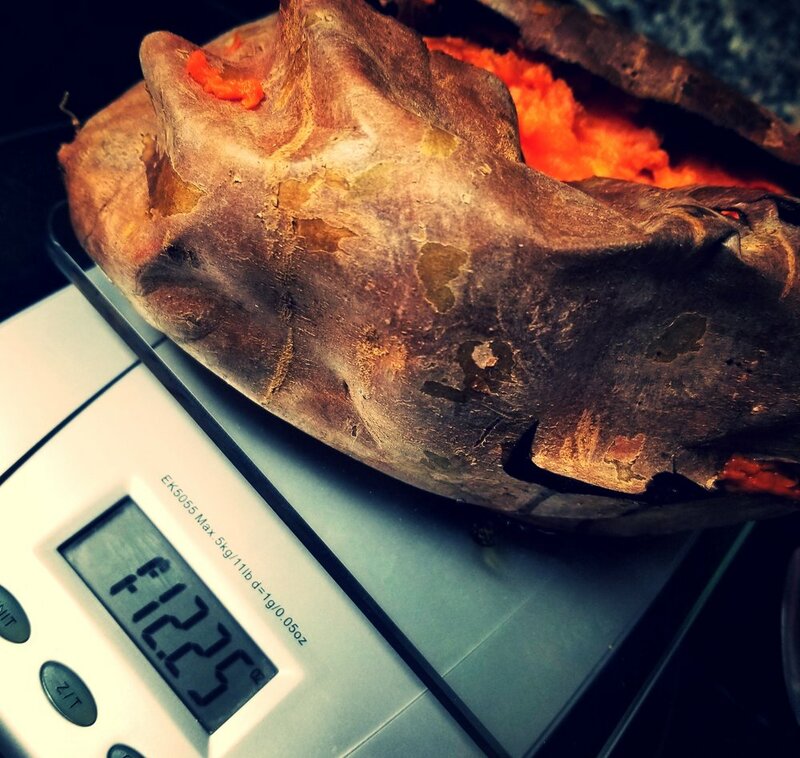 THIS SWEET POTATO WEIGHED IN AT OVER ONE POUND! Sweet potatoes are a healthy food. But, like all starchy veggies, if you overeat them they can still make you FAT! I reserve starchy veggies like sweet potatoes, quinoa, and other whole grains for my heavy workout days when my body really needs them. They help me fuel and recover from intense training sessions. Even if you train hard, mindfulness about portion size is important when eating any sort of starchy calorie-dense carbohydrate. Keep this simple tip in mind: a serving of starchy vegetables should be roughly equal in size to your tightly balled fist….not your whole face! Still, I wasn’t about to waste all of that beautiful and perfectly cooked sweet potato! So I decided to “re-purpose” it as a healthy side dish to the next day’s dinner. Bonus: I served these sweet and spicy potato and quinoa cakes as a side dish next to animal protein, but sans meat (and the optional egg), this recipe is a great way for vegetarians and vegans to get a healthy dose of complete plant-based protein! Put sweet potato, quinoa, and beans in a bowl and set aside. I found it easier to work with cooled ingredients, so don’t worry if your potato, quinoa and beans are cold! Heat olive oil over medium heat in a saute pan and add onions and salt. Cook until onions are soft and translucent, about 5 to 6 minutes. Add garlic and cook one minute longer, stirring. Add onion and garlic mixture to the bowl with the sweet potato, quinoa, and beans. Add all other seasonings. Add the egg (optional). I personally found that these patties are quite delicate, even when fully cooked, and they don’t hold together well, so adding an egg to this step before mixing can help them to “hold together” better. Mix with your hands until all ingredients are well-combined. Form into small balls, about the size of a golf ball and then flatten into patties. Cook in a non-stick skillet greased with a little bit of olive oil, butter, or coconut oil for 3 minutes per side. I admit that I wish these patties held together a bit better. They fall apart fairly easily, so don't be surprised if they do the same for you if you try the recipe! I found that adding the eggs and making smaller and thinner patties was helpful...but they were still delicate. If you find a secret way to make them hold together, please let me know! While they definitely aren’t sturdy like a burger, they pack an amazingly sweet, smoky, and spicy punch! Even my husband liked them, and that speaks volumes! They are a satisfying side to a juicy steak or pork chop, or eaten alone over a simple salad. Just be careful with those portions! I loved these delicious little cakes so much, I found myself going back for seconds that I probably didn’t need!